"For extra flavors, add a splash of sherry to the soup before serving." In a large saucepan over medium heat cook onion, garlic, ginger and crushed red pepper in oil for 2 minutes. Pour in broth, carrots and celery and bring to a boil. Reduce heat, cover and simmer 5 minutes. Stir in snow peas and shrimp, cover and cook 3 minutes. 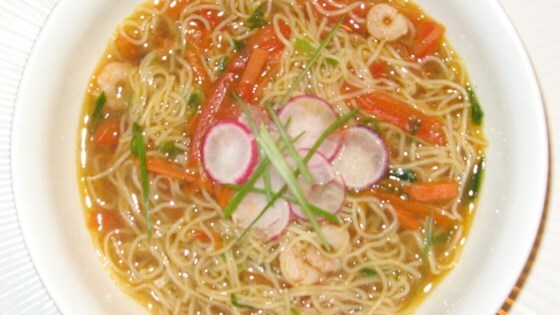 Break noodles into 2 inch pieces and stir in to soup; cover and cook 3 minutes more, until vegetables are tender and shrimp is pink. Stir in soy sauce and pepper and serve. Sorry, but as written this was very bland and did not even taste Asian at all. Also added spinach, napa cabbage. Used a full pound of shrimp. Added a dash of sesame oil. Used soaked rice noodles. Soak in hot water 10 min then cook with the soup. Would make again. I cut the ingredients in half but otherwise followed the recipe to a T. It came out great. I think the trick is not using low-sodium chicken broth. We love this soup! Even my young daughter eats this. I use pre-cooked frozen shrimp because I always have it on hand. Easy to throw together and doesn't need too many exotic ingredients. I'm a grad student, and this was great to serve to a bunch of friends for not much money ;) Great light soup.